H.H. 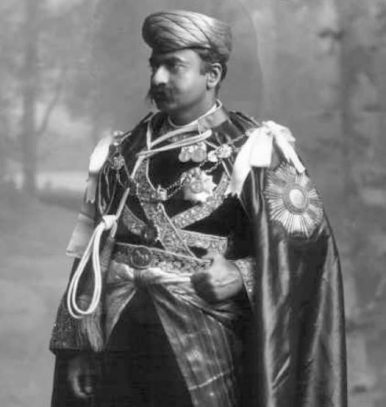 Maharaja Thakore Shri Sir Bhagwant Singhji Sagramji Sahib Bahadur, Maharaja of Gondal, GCSI, GCIE, 1911. How a progressive Indian Maharaja revolutionized girls’ education in the early 20th century. In philanthropy today, it is widely accepted that investment in girls’ education yields high social impact. This is most recently personified by Malala, whose Malala Fund appeals to our hearts with stories and our heads with data showing that educating girls improves the economies, health, stability, and environment of countries and communities around the world. Recently and unexpectedly, I came across a prominent proponent of this theory – not at Davos or the United Nations or the Bill & Melinda Gates Foundation – but rather in a family library in India leafing through documents that explain social experiments begun exactly 100 years ago. Chances are you’ve never heard of Gondal, a small city in western Gujarat now known for its thriving metals manufacturing industry, proximity to the lion-filled Gir Forest, and eponymous chili peppers, which are served fried for breakfast. In the mid-19th century, Gondal was also known for many progressive social innovations that we would now categorize as “high impact philanthropy” funded by “public-private partnership.” Chief among these, in my opinion: free and compulsory education for girls. This idea was the brainchild of the Maharaja Bhagwat Singh, who ruled Gondal from 1869 until his death in 1944. Educated at the University of Edinburgh, he was the only Maharaja who became a medical doctor and the only princely ruler to become a Fellow of the Royal College of Physicians of Edinburgh. He was also a lawyer and engineer, acquiring 11 different degrees during his lifetime and publishing the largest Gujarati dictionary and the first Gujarati encyclopedia. Returning to Gondal from his education abroad, Bhagwat Singh implemented a set of reforms and innovations that were astonishing in their depth and breadth, and in their intention to improve the lives of the citizens of Gondal, even in today’s terms. While these were accomplished through his public administration, he also leveraged both personal and private charity to build schools, train teachers, and increase the number of girls attending school more than 25-fold over a 50-year period. Among the Maharaja’s most celebrated innovations was that he abolished all taxes, customs, and export duties, making Gondal the only state in India to be tax-free. He reformed the state administration, erecting hospitals, colleges, and schools – including a replica of Eton that is still used for schooling today. He brought modern animal husbandry techniques to rural farmers and built irrigation networks. Starting in the 1920s, he introduced sewage, plumbing, rail lines, telegraphs, telephone cables, and electricity to Gondal, making it the first city in India to adopt such modern technology. The sewage and electricity lines were installed underground, a forward-thinking move that has been replicated only in the largest of Indian cities today. Every village in Gondal had a phone, post office, and police station. He was concerned about the environment as well, planting thousands of trees and forbidding hunting. In a famous story, when there was drought and famine, he put thousands to work not building a new palace for himself, as other Maharajas had done in similar circumstances, but creating a dam and reservoir for the public good that controls irrigation even now. Notably during those dire times, he established a “task work system” funded by the state that paid citizens at all levels according to their strength to work, reasoning that his farmers and artisans would be embarrassed by charity hand-outs when they were starving. Only the weakest and most infirm were given free food and shelter without asking for any work in return. However, one of his most notable decrees was in 1917. That year, he took the revolutionary step of making education free and compulsory for girls between the ages of seven and 11 in all villages of Gondal. He did this after reviewing dismal statistics on girls’ literacy in Gondal from 1911, showing 10 percent literacy among boys but only 2 percent among girls. Ahead of the decree, he sent officials into the countryside to explain the new rule to parents and respond to questions and concerns. Wisely, he enforced this decree too; if a girl did not show up to school for three consecutive days, he sent someone to the home to find out what was happening and, if an unsatisfactory reason was presented, demand that the girl be sent to school. What was the thinking behind this decree? Books about the Maharaja from that time paint a portrait of an enlightened leader, committed to female empowerment. He opposed polygamy and child marriage, stating that women should have the ability to choose their husbands. He also abolished the purdah system, prevalent during that time, in which women were secluded from the public by wearing concealing clothing and by the use of high walls, curtains, and screens within the home. In fact, under his rule, “Zananas,” or restricted women’s wings, were no longer built in any of the palaces. At the urging of her husband, the Chief Queen, Maharani Nandkunvarba, famously broke the long-lasting custom herself by appearing unveiled in public. She was presented the “Crown of India” award by Queen Victoria herself for her efforts to bring women dignity and importance. had a social value that could not be exaggerated. She, in time, would bear children and the children would be under her almost exclusive care during the most impressionable years of their lives. If she had attended school they would imbibe education as they fed at her breast, or were dandled in her arms, or tugged at her sari as she went about performing her daily tasks. To educate a girl therefore meant that a whole family would be uplifted; whereas to send a boy to school might conceivably mean that only a single individual had enjoyed the benefits flowing from the fount of knowledge. The results speak for themselves. In 1916-1917, the number of girls in school in Gondal was 891. Just 12 months later, that number had increased nearly five-fold, to 4,101 girls in school. By 1925, the percentage of girls in school in Gondal stood at 3.2 percent, compared with Bombay, a major city, at 2.25 percent. By the time of the Maharaja’s “Golden Jubilee” in 1934, significant progress had been made in education in Gondal, both for boys and for girls. In particular, the number of students in Gondal had increased from 2,500 to 19,780, according to Shree Bhagvat Sinhjee: The Maker of Modern Gondal, by St. Nihal Singh. Girls made up 42 percent of that number. The number of schools had increased from 30 to 191. Educational expenditure from the public purse had increased 10 times, while expenditures from private charity went from zero to over 30,000 rupees and gifts from the Maharaja’s own personal charity had gone from zero to over 1,400,000 rupees. Today, we talk about the importance of innovation and replication in philanthropy, the leverage obtained from public-private partnerships, and the high social impact of investing in girls’ education. More than 100 years ago, the Maharaja Bhagwat Singh not only understood these concepts but implemented them actively in his state, with results still evident today. According to the latest Indian census numbers, from 2011, the literacy rate of the state of Gujarat, where the city of Gondal is located, is 79.31 percent — 87.23 percent for men and 70.73 percent for women. This ranks Gujarat in the middle of Indian states in terms of literacy: 18 out of 36 states, with Kerala at the top and Bihar at the bottom. In the city of Gondal, however, the literacy rate is higher than that of the state: 84.26 percent overall – 88.6 percent for men and 79.62 percent for women. This ranks Gondal closer to the Indian state of Himachal Pradesh in terms of literacy rates, 11th on the list of 36 states from the 2011 census. Significantly, the family’s tradition of giving continues in Gondal as well – in particular to support agricultural projects and schools for girls. At the Maharani Shree Rajkunwarba Girls High School in Gondal, over 500 girls ages 10 to 16 board at the school and graduate from secondary school. Nearly all go on to complete their 11th and 12th standards and 80 percent matriculate at local universities. When I asked the current Maharani in May 2018 why the family feels so passionate about this school, she said, “It is very clear. We know that education is the pivot of social progress and that the education of girls is critical to our future.” Her grandfather-in-law, the Maharaja Bhagwat Singh, would agree. Daniela Kaisth is President of Gratias Partners and Vice President of the EastWest Institute. In India’s Elections, Voters Will Choose Between Guns and ButterForget Cricket Diplomacy. The Game Is a Casualty of India-Pakistan TensionsBeggar-Thy-Neighbor: The Effects of Revoking Pakistan’s MFN StatusDepoliticizing South Asia’s Water CrisisSri Lanka: Caught in an Indo-China ‘Great Game’?